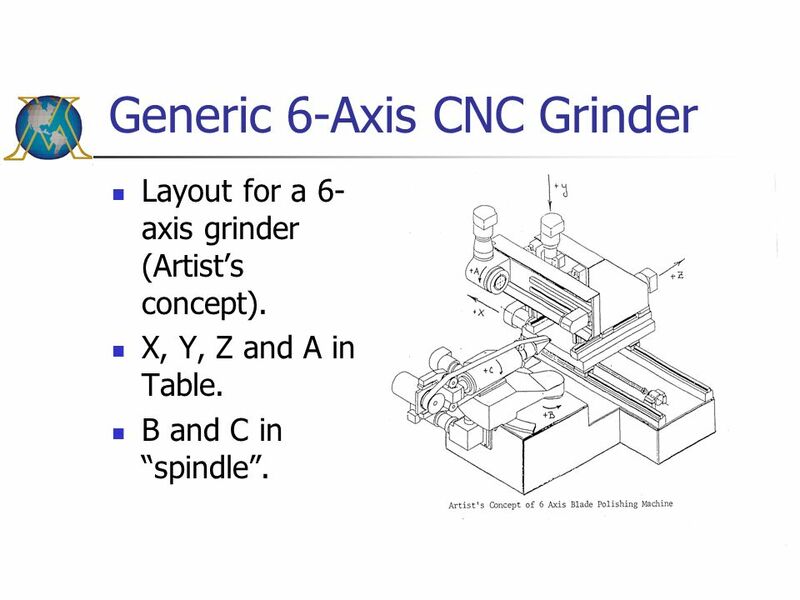 Layout for a 6-axis grinder (Artist’s concept). X, Y, Z and A in Table. B and C in “spindle”. 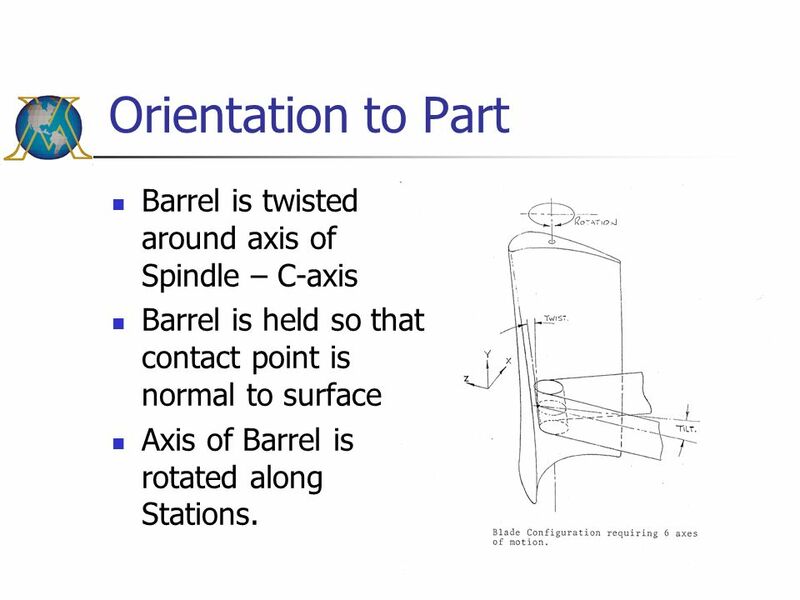 Barrel is held so that contact point is normal to surface Axis of Barrel is rotated along Stations. 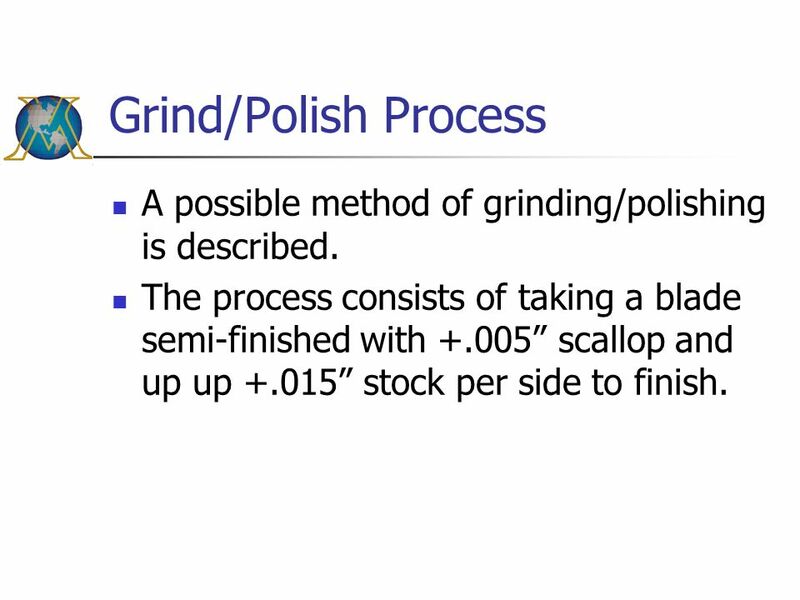 6 Grind/Polish Process A possible method of grinding/polishing is described. The process consists of taking a blade semi-finished with +.005” scallop and up up +.015” stock per side to finish. 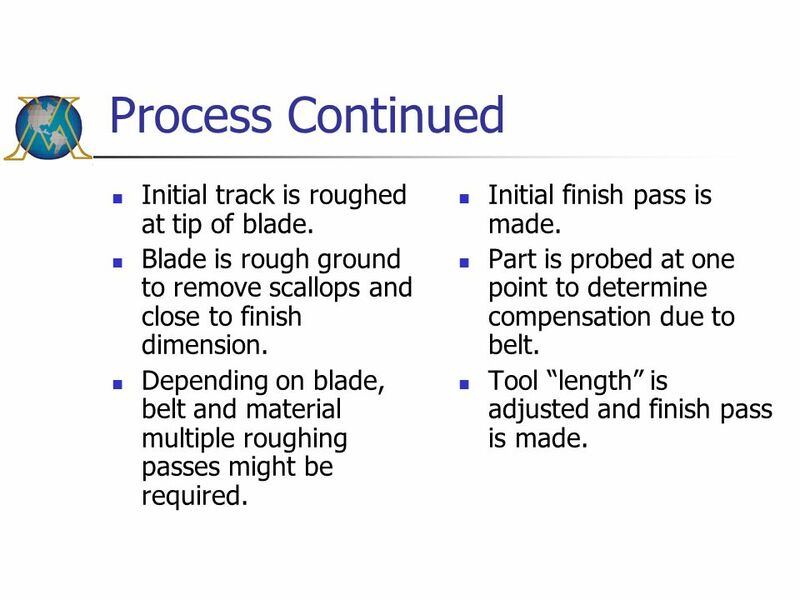 7 Process Continued Initial track is roughed at tip of blade. Blade is rough ground to remove scallops and close to finish dimension. 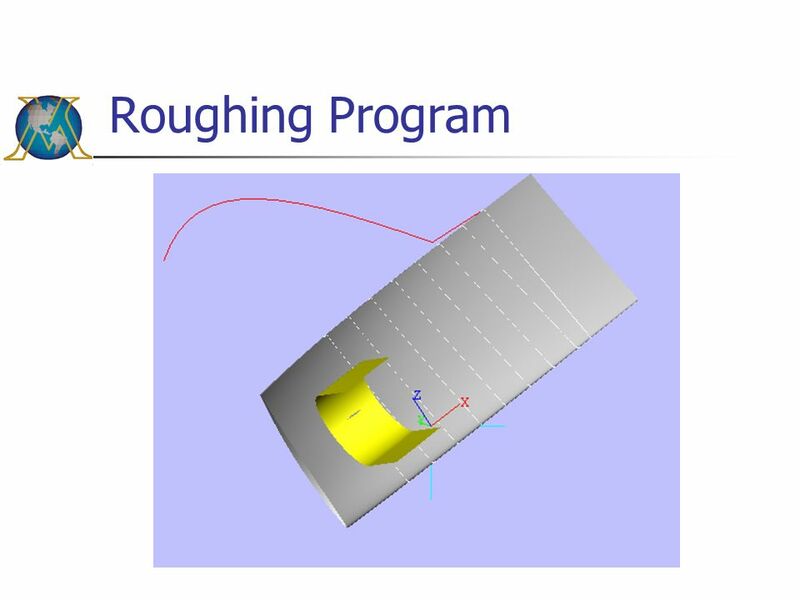 Depending on blade, belt and material multiple roughing passes might be required. Initial finish pass is made. 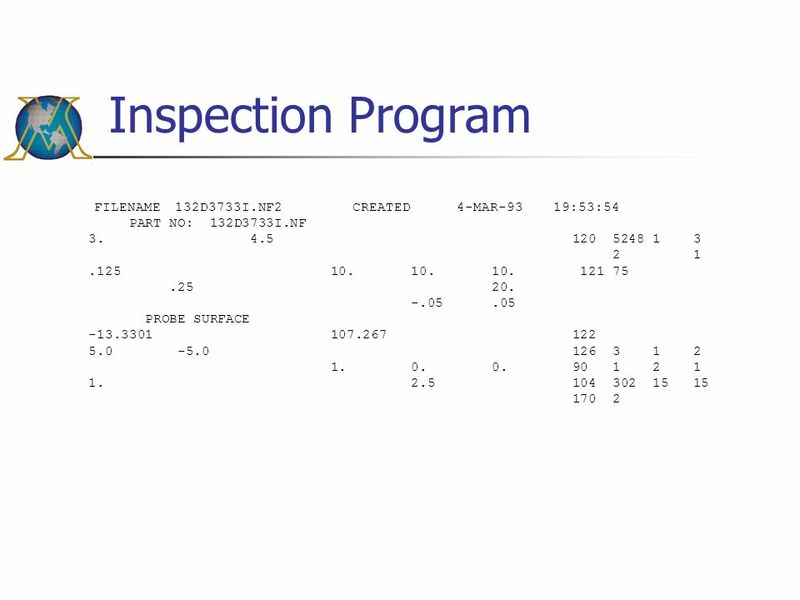 Part is probed at one point to determine compensation due to belt. Tool “length” is adjusted and finish pass is made. 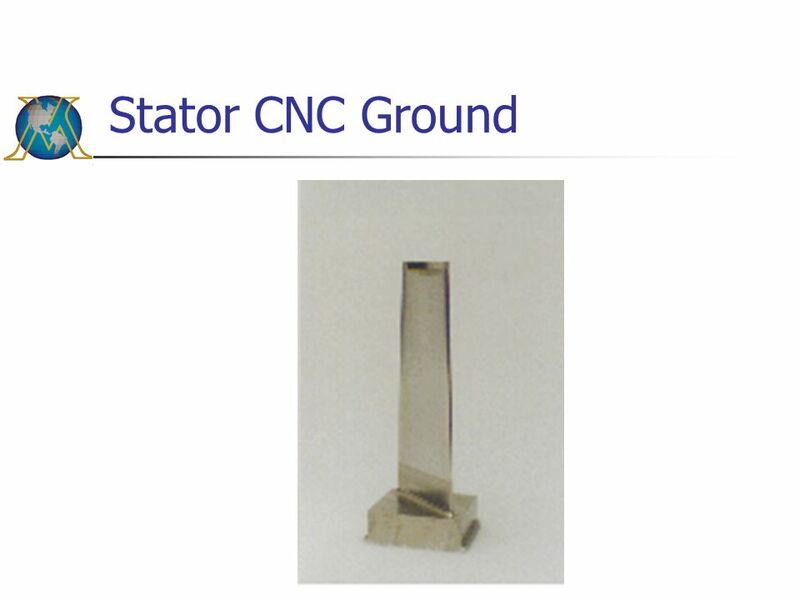 8 CNC capability Continuous 6-axis operation with 5-axis tool length compensation is required. 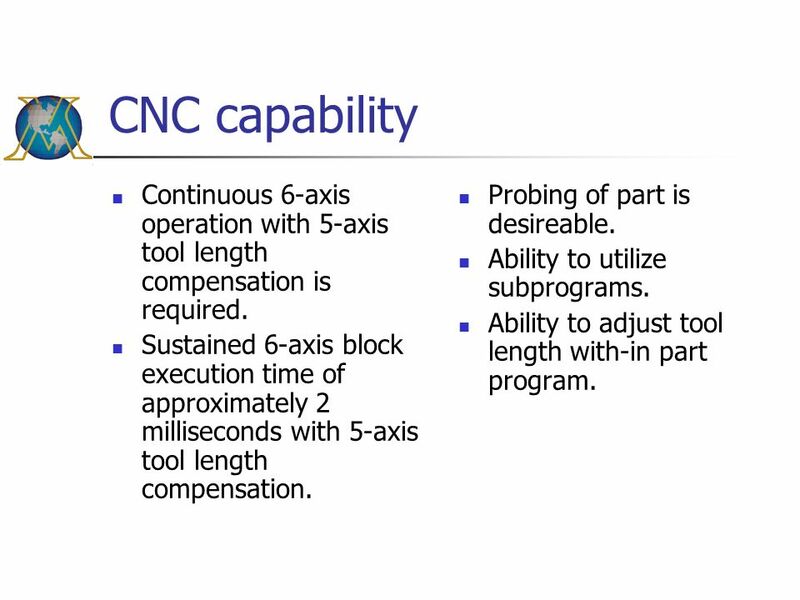 Sustained 6-axis block execution time of approximately 2 milliseconds with 5-axis tool length compensation. Probing of part is desireable. Ability to utilize subprograms. 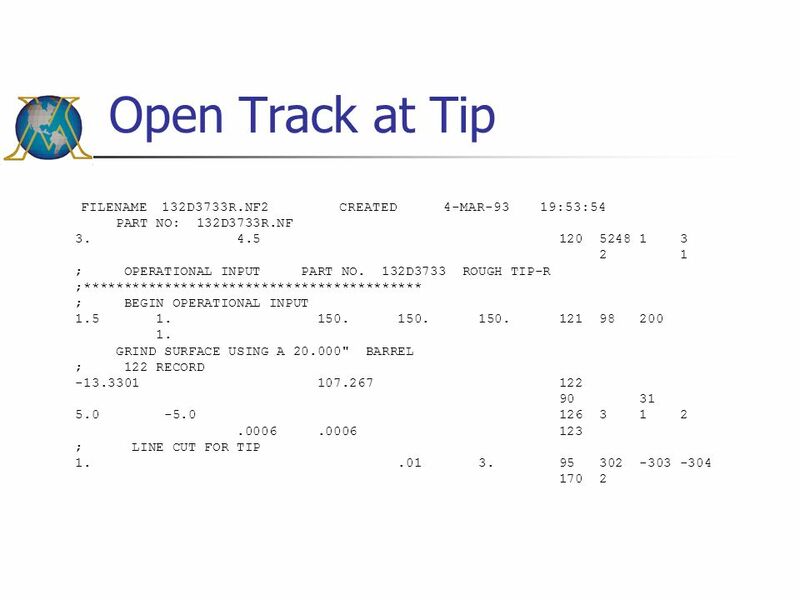 Ability to adjust tool length with-in part program. 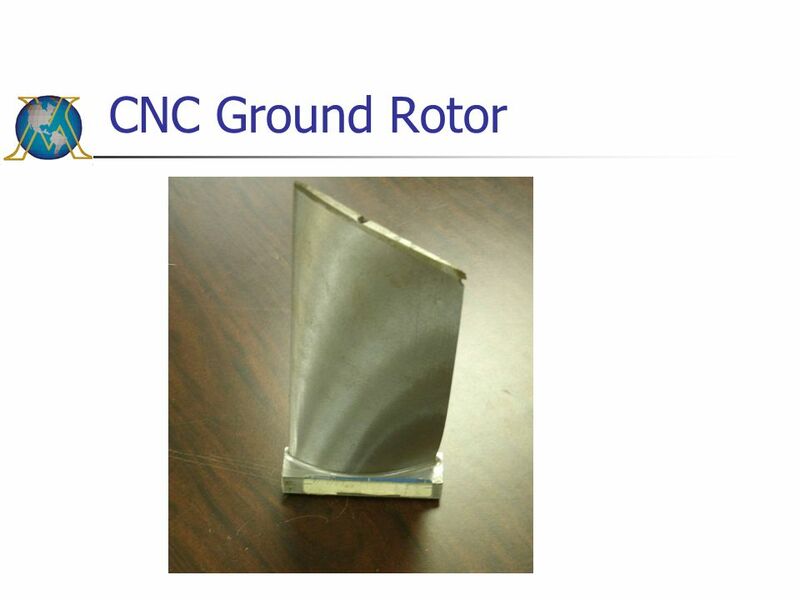 Grinding/polishing operation is controlled by a master program. 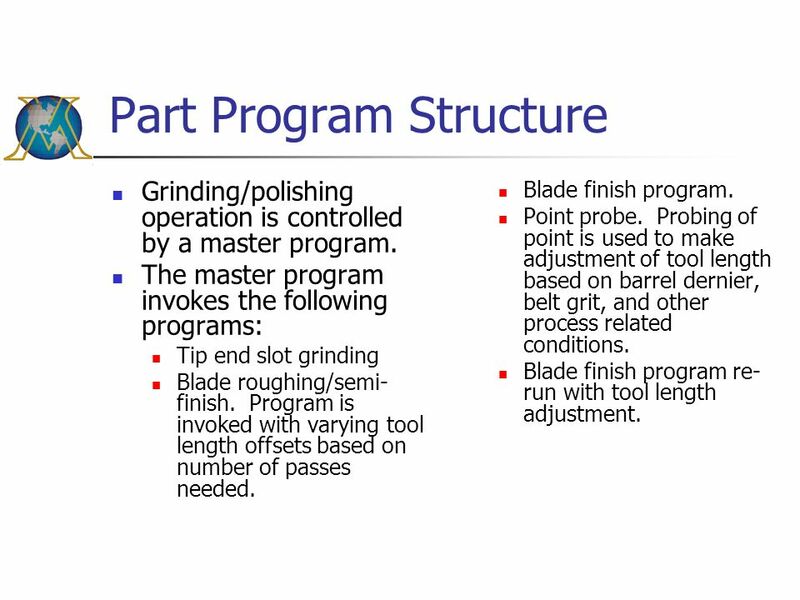 The master program invokes the following programs: Tip end slot grinding Blade roughing/semi-finish. Program is invoked with varying tool length offsets based on number of passes needed. Blade finish program. Point probe. Probing of point is used to make adjustment of tool length based on barrel dernier, belt grit, and other process related conditions. 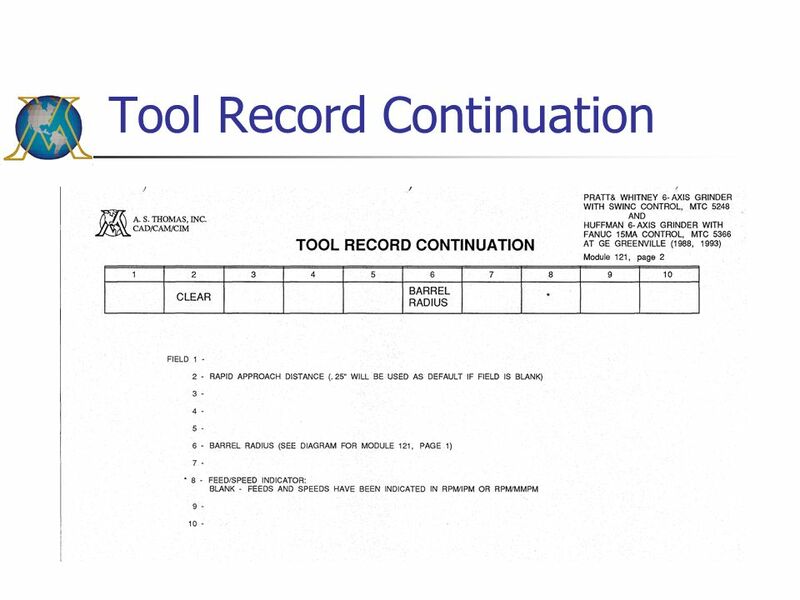 Blade finish program re-run with tool length adjustment. 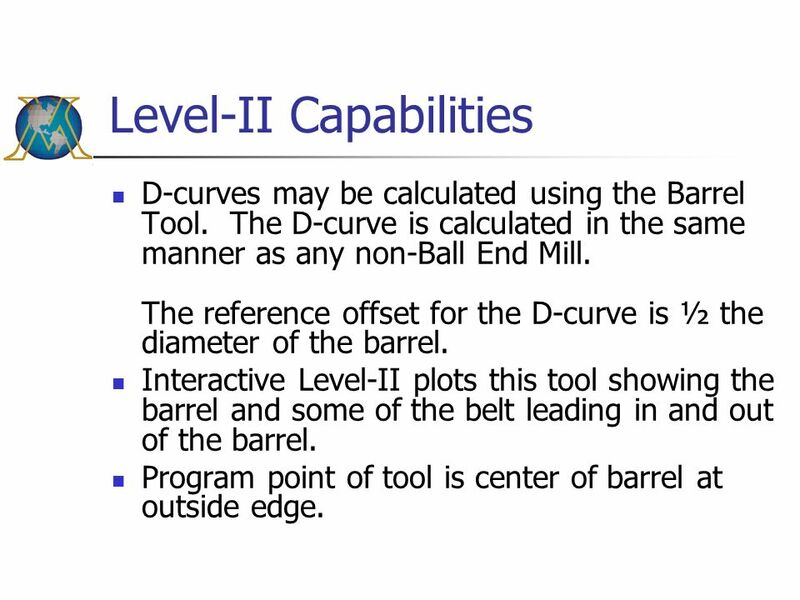 D-curves may be calculated using the Barrel Tool. 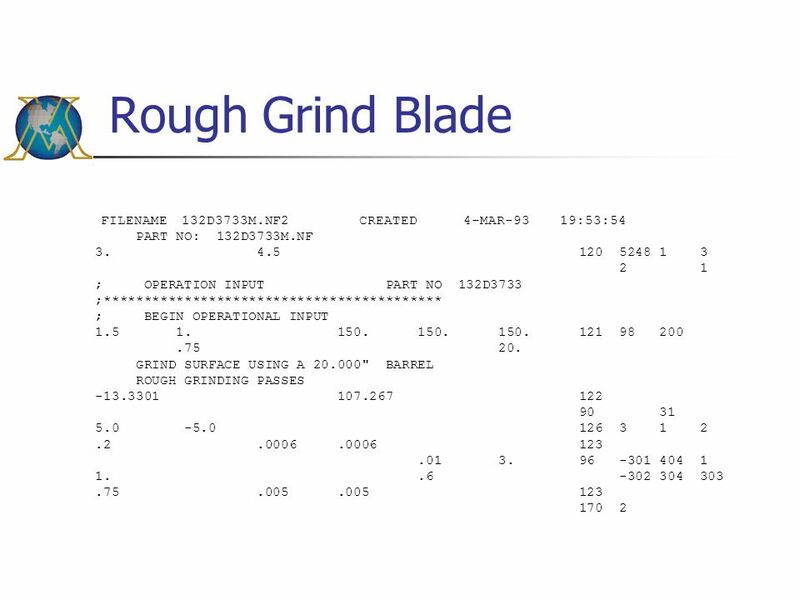 The D-curve is calculated in the same manner as any non-Ball End Mill. The reference offset for the D-curve is ½ the diameter of the barrel. 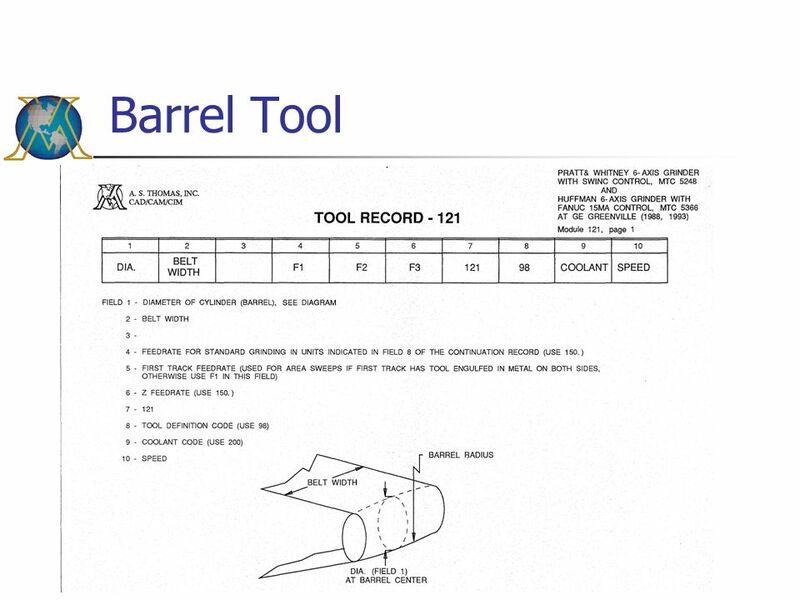 Interactive Level-II plots this tool showing the barrel and some of the belt leading in and out of the barrel. Program point of tool is center of barrel at outside edge. 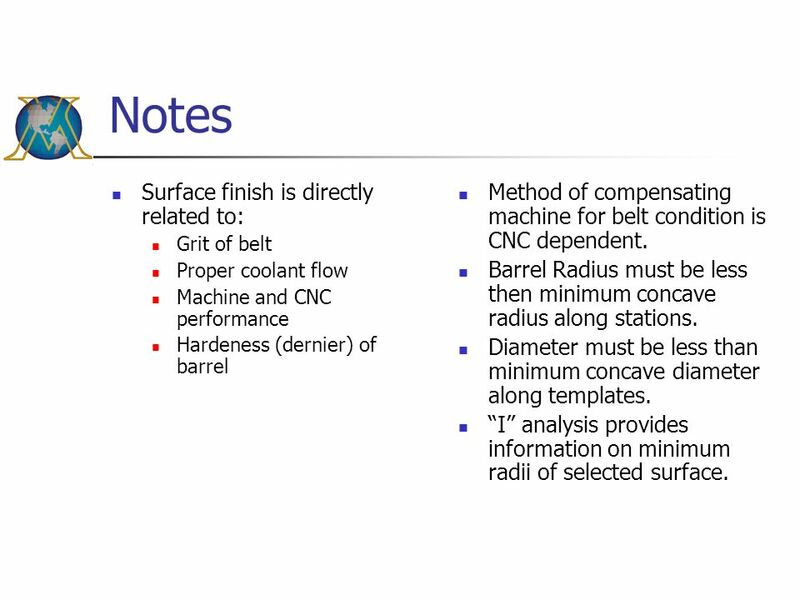 Grit of belt Proper coolant flow Machine and CNC performance Hardeness (dernier) of barrel Method of compensating machine for belt condition is CNC dependent. Barrel Radius must be less then minimum concave radius along stations. 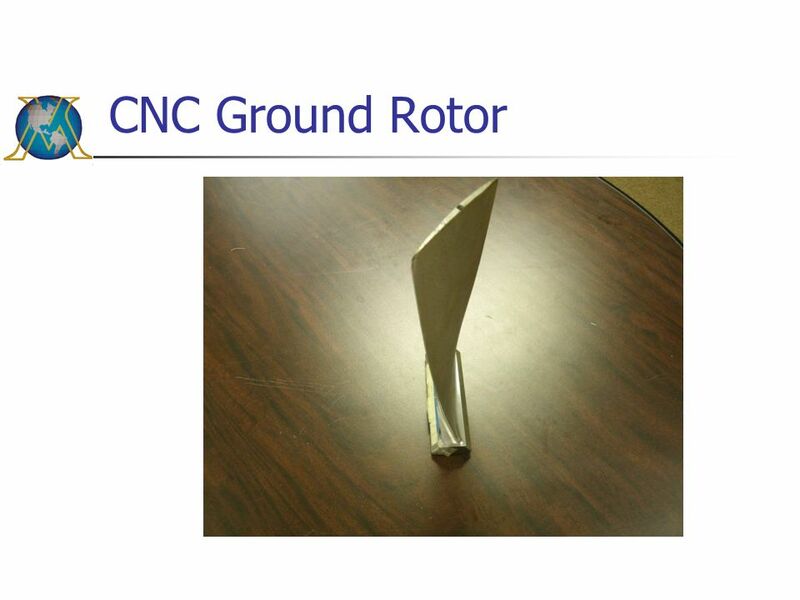 Diameter must be less than minimum concave diameter along templates. “I” analysis provides information on minimum radii of selected surface. 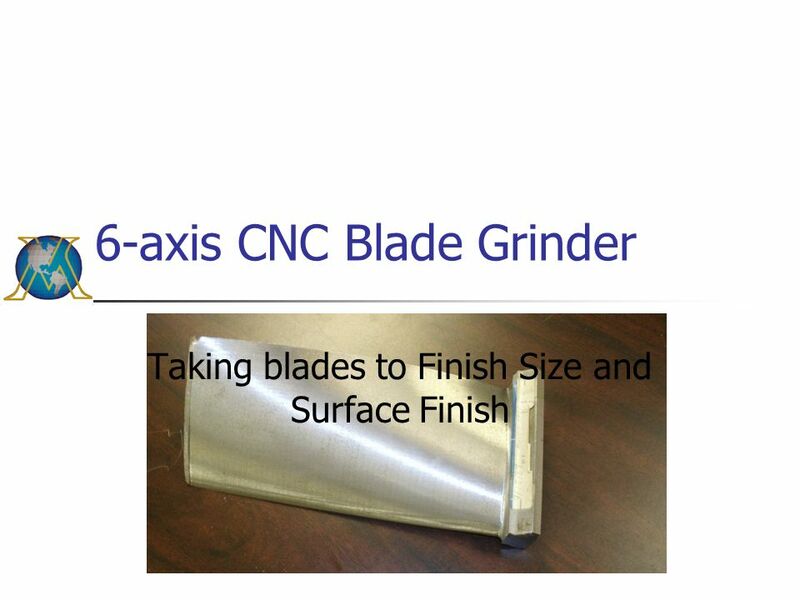 Download ppt "6-axis CNC Blade Grinder"
Objective Use agricultural mechanics tools properly and safely. Precision Machine & Mfg., Inc.